A few weeks ago I purchased an oyster seed grading machine from Myers Welding, a metal fabricator in Tignish, PEI. We were talking shipping options, and on a whim I decided I was long overdue for a drive to the shellfish capital of Canada, Prince Edward Island. I had only been to PEI once before for the funeral of oyster grower and friend Troy Jeffery, who tragically passed away last year doing the work he loved. This trip would be very different. After 11 hours of driving I crossed the Confederation Bridge around 4PM and headed towards Morell, PEI, home to Atlantic Shellfish and PEI Mussel King. Unfortunately it was getting dark and it was too late to get out on the water, but just getting to meet the people who grow our shellfish is always enjoyable. The Dockendorff’s run PEI Mussel King and Atlantic Shellfish. The Mussel King building dwarfs the oyster building, but as Jacob and Russel explained they are ramping up their oyster business bigtime. This was the general theme that I noticed during my trip. Next I went to the headquarters of Raspberry Point Oysters, in Charlottetown. I quickly learned that the Linkletter name is ubiquitous with great tasting PEI treats. Not only do they run one hell of an oyster business, but they also own “Cow’s Creamery”, makers of amazing ice cream, aged cheddar cheese and butter, all originating from PEI cow milk. They also own “Anne of Green Gables” Chocolates and screen print their own line of T-Shirts. I was staying with Scott Linkletter, owner this island empire, in his cottage at the head of New London Bay, on the north side of PEI. I woke up to a gorgeous view of New London Bay. Scott’s crew was already busy on the Bay, pulling oysters out of the shallows to get them prepped for winter before the ice moves in and crushes them. Scott made a breakfast of PEI potatoes and his famous cheddar, while talking about the talents of Canadian Leonard Cohen. We then met James, the General Manager of Raspberry Point, along with some of the office crew that was out to tour the farm operation with me. 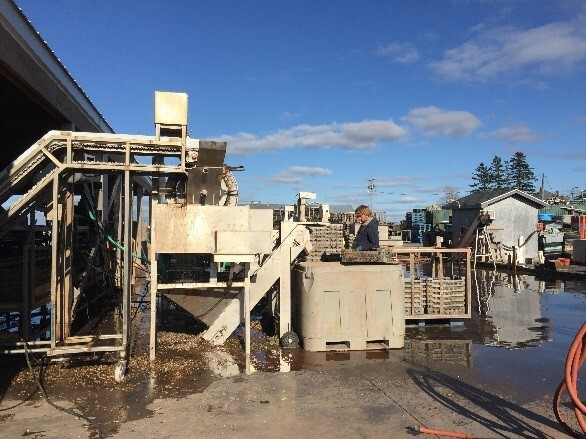 The next several hours were spent touring the various farm sites of Raspberry Point Oyster Co, spread throughout the north-central inlets of PEI. These included the Irish Point, Daisy Bay, Lucky Lime and of course Raspberry Point farm sites. Each farm site had its own crew and boats, and its own supporting shore side facility where oysters were sorted and gear was stored. Each of the crews were busily prepping for winter. I quickly noticed that almost everything at Raspberry Point is mechanized, a luxury that we can’t justify on our small 3 acre farm in Duxbury. Hydraulic booms lift cages, conveyor belts move product, and optical sorters were culling and counting as fast as they could be fed. All said and done the Raspberry crews work about 400 acres of shellfish beds. Keep in mind the entire state of Massachusetts has only 1030 acres of shellfish farms. It was a truly impressive operation with a fabulous and dedicated crew! One aspect of the Raspberry Point Farms that is not mechanized. 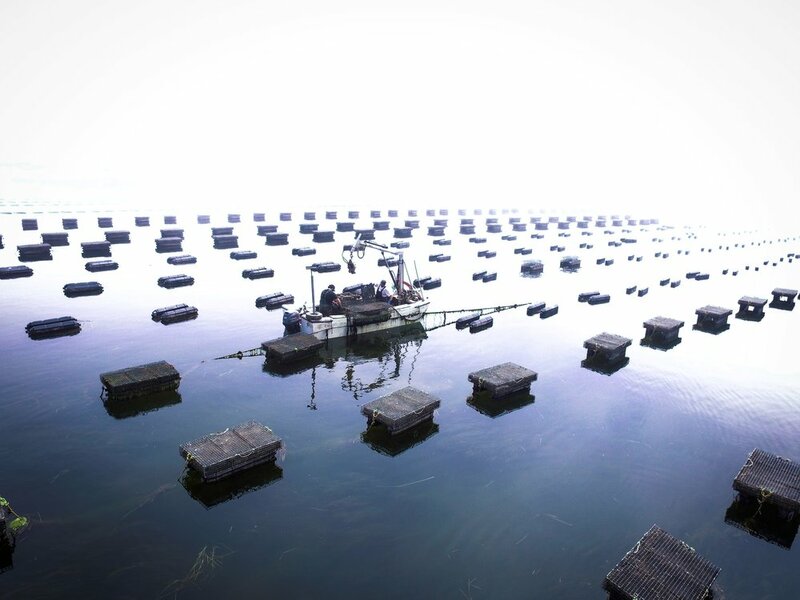 A diver sinks 400+ floating OysterGro® cages a day to keep them safe from winter ice. Bill and STANLEY Oyster's seed operation in Orwell Cove, PEI. Wild seed is caught on Chinese hats, grown out in bags and then sold to other growers or used to supply their own farms. On day 3 I took my first helicopter ride with Brian Fortune, owner of Bill and Stanley Oyster Co. Brian was a pioneer of the mussel industry on PEI, starting Atlantic Aquafarms / Canadian Cove Mussels back in the late 80’s. Brian since sold the mussel giant and went heavily into the oyster business, farming about 1200 acres of leases on PEI. Much of his business on PEI was centered on catching wild oyster seed and growing it out for a season for sale to other growers. It was great to see this side of the business that you never hear about. Today we were flying from his home in Orwell, PEI to his farm sites on the south side of Nova Scotia. We lifted off and took a quick lap around some of oyster leases on PEI. We headed south towards Nova Scotia at a speed of 107 knots. Brian seemed to know just about everyone in the business. We talked shop and made quick work across the narrow part of the island towards Whitehead Harbor. With an additional 1300 acres on Nova Scotia, touring his leases by helicopter was the only way it was possible in a single day. Brian floats all of his oysters on NS in OysterGro® systems, which seemed to be the new gear of choice in the Maritimes. He had rights to entire bays. Again I was feeling very jealous of the resources that the sparsely populated country offered. Brian’s oyster facility was equally impressive. Again technology was the name of the game. After all, how else could you process oysters from 2500 acres of leases? I visited with Brian, his crew and his son Jesse. Today they were making plans for a “gondola” of sorts that would move sorted oysters from their downstairs grading room to the upstairs packing room. Amazing! I won’t bore you with the details of my drive back, but it included lots of iced tea, and plenty of thoughts about the future of the oyster industry. The scope of the Canadian oyster industry is staggering, especially when coming from a state that is only handing out 2 or 3 acre lease sites. Growers to the north are ramping up production in a giant way. Many of them are only at about 50% production, but are increasing every year. The sparse population of most of PEI and NS means very few user conflicts, which means more shellfish farms are coming. All of this production has to go somewhere, which makes me wonder if a price correction could be coming. It takes a lot longer to grow an oyster up there, so stay tuned in the coming years….